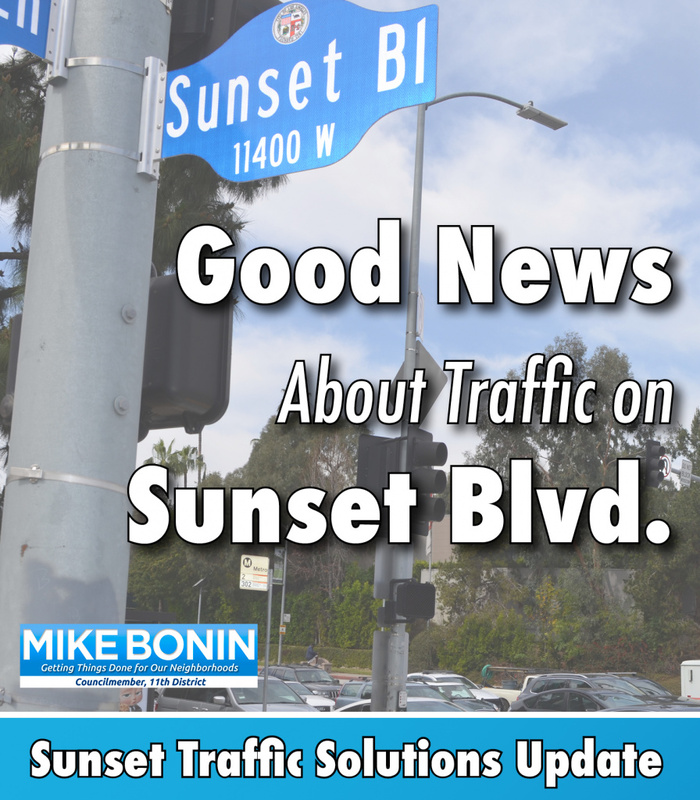 Here’s something you don’t hear every day: I have some great news to share about traffic on Sunset Boulevard. Under its Conditional Use Permit with the City of LA, Brentwood School is required to reduce peak hour trips at its East Campus by 35% in 2022-2023, and by 40% five years later in 2027-2028. Recently, the school notified parents that it wanted to meet the goal of a 40% reduction in that peak hour car traffic during the upcoming school year. That is huge! This is the result of my “Sunset Standard,” which requires any entity seeking land use approvals along Sunset Boulevard to actually reduce its traffic impact. Yes, reduce. That’s the standard I applied to both the Archer School for Girls and the Brentwood School, and they are delivering. My thanks to Brentwood School for this particularly ambitious effort. We all look forward to the fruits of its success. Last year, I announced a special program to combat Sunset traffic — a first-in-Los Angeles program to synchronize traffic flow from a city street onto a state-owned freeway. With dynamic ramp metering technology, we will be able to maximize overall flow and reduce the delays from the I-405 that spill over onto city streets. The team is now on board and the project is in design. It should be fully operational next year and you can learn more in the fact sheet below. As always, I am open to any and all ideas to improve traffic. If you have further ideas to suggest, please email my Transportation Director Eric Bruins at eric.bruins@lacity.org.